We can talk trends, speak style and give tips about fashion, but no matter the season nothing makes an outfit sing like a winning smile. The traditional methods of dental equipment and dental care like pastes, brushes, mouthwash and floss are so varied it’s hard to choose something that works for you. Some newer innovations are also coming into play, with brands like Quip trying to entirely revolutionise the idea of a “toothbrush” and turning it into more of a “jawscrub”, a term I had never heard of before researching into this article. I just love the chemistry behind beauty, and think that we all need to know a bit more about what we are using and where it comes from. I want you to consider this post as a sort of dental de-mysticism, but also as a guide and review to help out those who struggle with their smile. Everyone’s been talking about this, and now so am I: it’s activated charcoal. 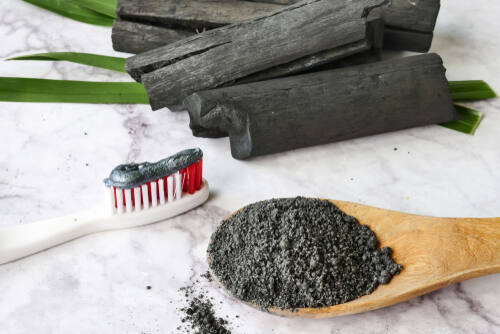 Activated charcoal is something that has been around for the better part of several decades, but you may have only just heard about it more recently, or maybe not at all. Before it became better known as a health supplement, it may have come to your attention thanks to those bizarre pictures of black ice cream cones that were making their way around the internet last summer. You might know charcoal better as the solid grey block you come across in art classes. This is actually the same material but with an extra set of special chemical treatments that give it some odd but rather useful properties. Following chemical treatments (usually done with bases, or extra oxygen) activated charcoal develops thousands of tiny, very shallow pores. This means that a single gram of activated charcoal can have between 500 to 1,500 metres of surface area! Why is activated charcoal a superfood? The idea that activated charcoal can work as a superfood to ‘adsorb’ toxins has lead some scientists into thinking perhaps it can adsorb many other harmful and less desirable things from our bodies too. Everything from the stains on our teeth to just plain, everyday toxins. That’s why people have been putting it in their ice creams and burger buns – that and it just makes the ice cream look much more Instagram worthy. Does activated charcoal honestly work? There’s definitely lots of science to say that adsorption is a useful process when it comes to water processing and toxin treatment. Those sorts of industries aren’t usually as influenced by the industry I come from- media. Evidence from magazines and online reviews is usually more anecdotal rather than data-based. The idea that activated charcoal could adsorb the stains on your teeth does seem plausible based upon my investigation, but unlike other toothpastes you might want to wash your mouth out thoroughly after brushing! In regular toothpaste, the active ingredients do their best work if they are left on your mouth. With active charcoal, it’s more of a ‘one-and-done’ solution. When it comes to dental equipment, there may be more mileage. 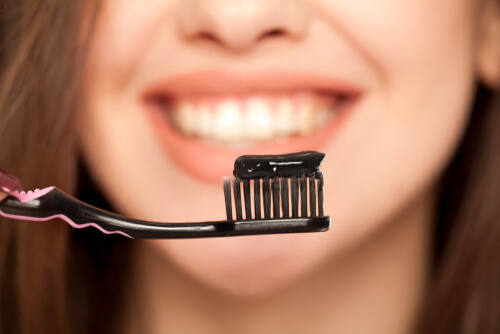 Toothbrushes with activated charcoal in their bristles may be especially useful since you blend direct contact with the teeth plus the vigorous kinetics of a good old-fashioned scrubbing. The bristles can also adsorb mouth odours and other kinds of unpleasantness you might find lurking between your lips and behind your gums. While the science is currently still out on the subject of activated charcoal toothpaste and toothbrushes, the principle behind the idea is at least somewhat sound. Whether activated charcoal will remove the toxins you build up every day during a good cleanse is another question. Activated Charcoal certainly won’t harm anyone, and given all the before and after pics flying around, I might just give it a try- how about you?